Dr. Matthew Spangler enjoyed a summer of achievement in 2017—based on a mixture of long-running professional successes, recurring events, and brand new honors. In August, Dr. Spangler, associate professor of Communication Studies, became the first San José State University faculty member to win the prestigious Leslie Irene Coger Award for Distinguished Performance. Since 1994, the National Communication Association has bestowed the honor annually to teachers, directors, producers or performers who’ve created a body of live performances. He will receive his award during the Washington D.C.-based organization’s annual conference in Dallas in November. The award was announced roughly at the same time as the 15th production of his stage version of The Kite Runner—the former number one New York Times best-selling novel by Khaled Hosseini—was wrapping up its eight-month run at two different theaters in London’s famed West End theater district. 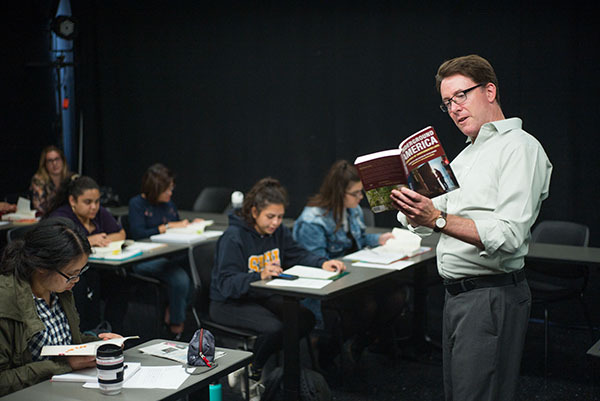 Dr. Spangler adapted the novel, which was also turned into a successful 2007 movie, for the stage and was first performed at San José State that same year and then by theater groups throughout the U.S. The professor/playwright said he has modified the play over the years by adapting the script to better reflect current events, including adding new characters to keep “The Kite Runner” relevant. The British production gave added emphasis to the experience of Afghan characters emigrating to the East Bay city of Fremont. Two graduate students working towards Master’s degrees in Communication Studies, Jenni Perez and Abigail Nuno, were among a small group of San José State students who made the trip to London last December to view the production. Describing it as one of her favorite novels, Perez said she was transfixed seeing the book turned into a stage play. “Though I always hoped to watch ‘The Kite Runner’ play in person, I never imagined my first time would be in London of all places,” she said. Nuno said other than losing feeling in her toes from the December chill of London; she has great memories of the trip to Europe. Both Nuno and Perez said they’re inspired by their professor. After the London productions, which drew audiences of about 100,000 from December to August, Dr. Spangler said that “The Kite Runner” is touring the U.K. until June. It was a busy summer—Dr. Spangler also presided over his third National Endowment for the Humanities Summer Institute for School Teachers, from June 25 to July 9, since 2014. This year’s event for 25 K-12 teachers from throughout the nation, titled “The Immigrant Experience in California Through Literature and Theatre”, featured talks by well-known academics and such authors and playwrights as Khaled Hosseini, Maxine Hong Kingston, and Luis Valdez. Also included were field trips around the Bay Area, including to Angel Island—known as the Ellis Island of the West—because of its immigration station operating from 1910 to 1940 that processed 500,000 immigrants. Dr. Spangler and his former colleague, Dr. David Kahn, professor emeritus from the SJSU Television, Radio, Film & Theatre department, received a $168,000 grant from the NEH to stage the Institute. Participants’ airfare was covered, as well as lodging at the Fairmont San José hotel and a small food allowance. It was one of about two dozen such gatherings sponsored by the NEH. Luis Valdez, writer and director of such acclaimed films as “Zoot Suit” and “La Bamba,” is considered the founder of modern Chicano theater and film. A former SJSU student, Valdez was joined as a speaker at the Institute by his son, Kinan Valdez. The elder Valdez is the founder and artistic director of El Teatro Campesino, the renowned San Juan Bautista theater company, where his son is also an actor and director. Kinalani Hoe poses with her certificate at the 2017 Honors Convocation, where more than 4,300 students were recognized for achieving GPAs of 3.65 or higher. San Jose State University recognized the outstanding academic achievements of 4,338 students, a record number, at its 55th Annual Honors Convocation on April 28. A capacity crowd – including family, friends, faculty and staff members – filled the Events Center, to hear words of encouragement and inspiration. Some of those words came from Persis Karim, honored as the university’s2017 Outstanding Professor and keynote speaker for the evening. 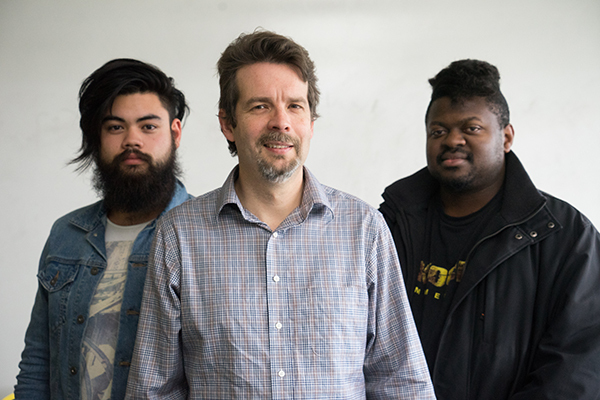 “Please don’t underestimate the power you have to affect this world and to affect and change the lives of other people,” said Karim, professor in the Department of English and Comparative Literature in the College of Humanities and the Arts. Karim, also the founding director of Persian Studies, directed her comments to the 430 President’s Scholars and 3,908 Dean’s Scholars from all colleges on campus. President’s Scholars are undergraduate students who have earned a 4.0 grade point average in at least two contiguous semesters of the three prior to the honors convocation. Dean’s Scholars are undergrads earning at least a 3.65 GPA in at least two contiguous semesters of the past three. Among the honored students were 62 Spartan student-athletes, also a record total, with six earning President’s Scholar recognition. It was the third year in a row that a record number of students involved in Intercollegiate Athletics achieved the rank of Dean’s or President’s Scholars. Many of the 2016-2017 scholars were proud to share how San Jose State affected their lives and to name educators who especially helped them on their successful paths. 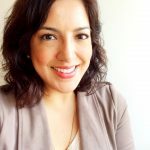 Sanchez-Cruz hired Valdovinos as a peer advisor for the Mesa Engineering Program (MEP), a program that aims to support educationally disadvantaged and first-generation students in attaining four-year degrees in engineering. “I learned how hard she works to make sure there are opportunities available for our students,” he said. Wendy Adhearn, Dean’s Scholar and kinesiology major from the College of Applied Sciences and Arts, noted that she has learned a lot from all her professors. Lucio noted that his professor’s passion for teaching makes learning fun and easy. In addition to Karim, three other San Jose State faculty members were recognized at the Honors Convocation: Brian Belet, professor of music and an accomplished composer, as 2017 President’s Scholar; Chris Cox, lecturer in sociology and interdisciplinary social sciences, as 2017 Outstanding Lecturer; and Lui Lam, physics professor, as 2017 Distinguished Service Award winner. 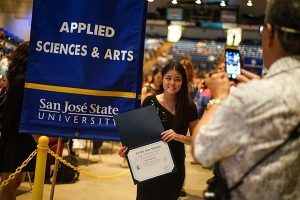 Learn more about more of this year’s San Jose State scholars, as well as recent history about Honors Convocation, online. 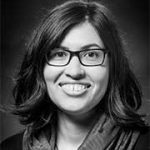 Associate Professor Rachael French, recipient of a 2017 Early Career Investigator Award, will present the final lecture in the University Scholars Series on Wednesday, April 26, from noon to 1 p.m., in the Dr. Martin Luther King Jr. Library, Room 225/229. Dr. French, who has brought in more than $1.2 million in external funding to support her research, will discuss the work she is conducting in her Drosophila Genetics lab. She and her student researchers are studying the impact of fruit fly development when eggs are laid in an alcohol-rich environment. Her goal is that her research may someday help in treatment of fetal alcohol syndrome in humans. 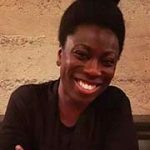 Financial backing for her studies, which started during her post-doctoral days at UC-San Francisco, comes from the National Institutes for Health and the National Science Foundation. Her research is aided by three graduate students and six undergraduate SJSU students. The University Scholars Series is supported by the University Library, the Spartan Bookstore, Faculty Affairs, the Office of Research and the Office of the Provost. A college student’s ability to learn is most positively impacted when the pupil has the opportunity to work as a partner on a research project with a member of the faculty, according to findings presented at a recent American Association of Colleges and Universities conference. 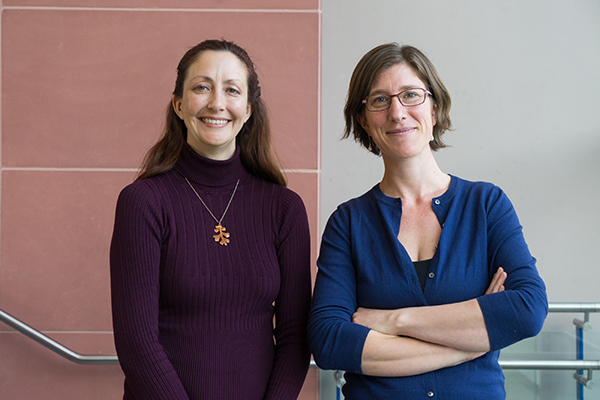 SJSU’s Student-Faculty Research Pairs program provides opportunities for 33 undergraduate students to work with faculty mentors. The 33 pairs will share their work at the Celebration of Research, on Feb. 16, from 4 to 6 p.m., in the Diaz Compean Student Union Ballroom. With the help and guidance of the Center for Faculty Development, each pair prepares a poster to describe their project and the questions they hope their research will answer. Created through the university’s unique “Explorations in Research, Scholarships and Creative Activity” program umbrella in 2012, it offers undergraduates the opportunity to enrich their student experience while attending SJSU. “As a pair, the idea is for the student and faculty member to write their proposal together, rather than the student write it and faculty member only approve it,” said Amy Strage, assistant vice president for Faculty Development. This year’s research areas range from astronomy to healthcare-related topics to exploration into areas of mental health to ballet. Junior biology student Puneet Sanghera has been working with Katie Wilkinson, an assistant professor of biological sciences on “The Effects of Lipopolysaccharide-Induced Inflammation on Spinal Cord Excitability.” Wilkinson’s lab interests have included proprioception – “the ability to sense where your body is in space,” she explained.